It’s always best to start the stain removal process with the gentlest method and use harsher methods as needed. If the stain is recent, you may be able to banish it with water alone. Turn the hose on with the water at full blast. If you have an adjustable nozzle, use the jet or similar setting. Sometimes water needs a little help. Try adding some Dawn dish soap for greasy stains. * It’s been used for years to remove oil spills from wildlife. Mix hot, soapy water in an inexpensive garden sprayer for easy application. For fresh oil or grease spills, blot up as much as you can. Then apply undiluted dish soap directly to the stain, let it sit for half an hour, scrub with a brush, and rinse thoroughly with hot water. A good, stiff broom or brush is handy for scrubbing away stains. Stay away from wire brushes. They could scratch or even gouge the surface. Besides that, they tend to shed wire bristles that can cause rust stains! An old toothbrush is great for scrubbing in cracks. A rotary tool with an abrasive detailing brush on a flexible shaft will let you get into tight spaces where even a toothbrush might not fit. A good, gentle cleaning mixture is 1 gallon of hot water mixed with 1/2 cup baking soda and 2 tablespoons dish soap. Spray it on and let it sit for half an hour. Scrub and rinse. Step your efforts up a notch with vinegar. Mix it 50/50 with hot water and spray stained areas. For really bad stains, apply straight vinegar. Rinse well afterward. Oxygen bleach mixed with hot water until it’s like peanut butter works well on many tough stains. Smear the paste into the stain, let it sit for an hour, and then scrub it with a brush. Okay, maybe it’s time to bring out the really strong stuff: trisodium phosphate and muriatic acid. Always follow instructions carefully and wear protective gear. These harsh chemical cleaners are not to be trifled with! 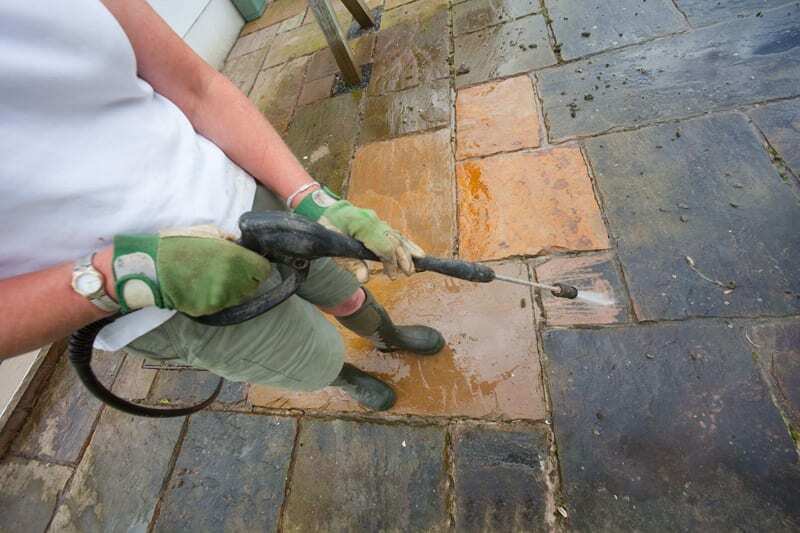 Power washing can remove many stains from the sheer force of water. Unfortunately, that same powerful force can cause permanent damage to your patio unless you know exactly what you’re doing. * Don’t ever try to scrub a fresh oil or grease stain – the more you scrub, the more it will spread! Instead, sprinkle it with something absorbent like cornstarch, cornmeal, or cat litter. Pat the absorbent in place and let it sit at least overnight. The next day, sweep up the residue and apply again if needed. Keep repeating until the stain no longer feels greasy. Then you can try scrubbing it out. Outfit yourself properly. 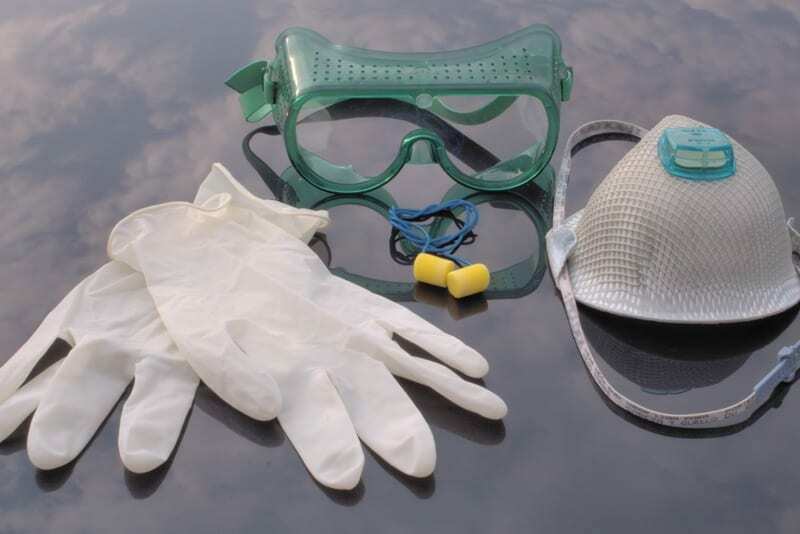 Gloves, face mask, and eye protection are a must if you’re using any kind of chemicals! Always test a new cleaning method in an inconspicuous area first before tackling more visible areas. It’s best to do this a few days in advance just in case problems don’t show up right away. Use plenty of water for rinsing and try to direct the rinse water away from plantings. If you’re looking to upgrade rather than just clean your patio, contact Sponzilli Landscape Group. 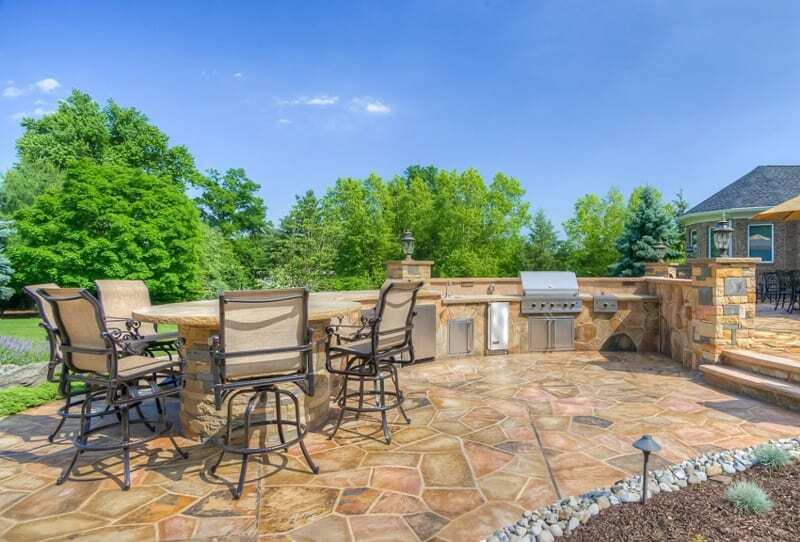 We can design and install the patio of your dreams! Rich Sponzilli, has been working in the landscaping field for over 42 years. As founder and owner of Sponzilli Landscape Group, Rich has created a reputation for outstanding landscape design, quality, and customer service. His design work ranges from upscale residential to major commercial projects throughout North Jersey and New York City. Richard’s industry knowledge and design style are well known throughout the tri-state area.